A few years ago, I had the delight of seeing the beautiful Lippizaner horses perform. I have been enamored with them ever since I was a child and saw the Disney movie, The Miracle of the White Stallions. The Lippizans boast a rich heritage. The forerunner of the Lipizzan was bred in Carthage, more than 2,000 years ago. The Carthaginian stock was bred to the Vilano, a Pyrenees horse, and with Arab and Barbary strains. The result became the fabled Andalusian horse of ancient Spain. If you’ve seen The Mark of Zorro, with Antonio Banderas, you may remember that his beautiful black horse was an Andalusian. Around 1562, Archduke Maximilian, later Emperor of Austria, began breeding Spanish horses. A powerful but agile horse was desired both for the military and for use in the fashionable riding schools for the nobility of central Europe. Eighteen years later, Archduke Karl, ruler of four Austrian provinces, established a royal stud farm in Lipizza, located in the hills of Karst, near Trieste. Fresh Spanish stock and Oriental stallions were added to the bloodline to maintain the strength of the breed. In the 17th and 18th centuries, horses from the northern Italian stud farm at Polesnia and the highly regarded Neapolitan strain were brought to Lipizza to mingle with the resident stock and the descendants of the original Spanish line out of Denmark and Germany. Today’s famous dancing stallions are trained in the haute école or "high school" movements of classical dressage, including the highly controlled, stylized jumps and other movements known as the "airs above the ground" at the Spanish Riding School of Vienna, which has existed for hundreds of years. The breed was nearly lost in WW2 when the Lipizzaner mares were separated from the stud farm of Piber and moved into Czechoslovakia, and then faced with possible destruction at the hands of the Russians. Spanish Riding School of Vienna, where the Lipizzaners are trained. Alois Podhajsky, the director of the school, made a bold request of the Americans, especially General Patton who himself had ridden in the 1912 Olympics, to save the horses. Patton appreciated the tradition of the Spanish Riding School and arranged the rescue of the breeding mares along with the allied prisoners of war who’d been caring for them, effectively saving the Lipizzaner breed. Had it not been for General Patton, there would be no Lipizzans today. From the time of their birth, the Lipizzans are raised with people around. Their caregivers and handlers interact with them so much that they are like part of the herd. It’s because of this close bond with their handlers and years and years of training that they are able to perform their beautiful dressage movements and magnificent feats. Originally, their “equestrian arts” were intended to be used in warfare, but today, they delight audiences worldwide. Levade - The horse must maintain a hunched position at a 45-degree angle to the ground, requiring muscle control and perfection of balance that is quite difficult. Mezair - A series of successive Levades in which the horse lowers its forefeet to the ground before rising again on hindquarters, achieving forward motion. Capriole - The stallion leaps into the air, drawing his forelegs under his chest at the height of elevation, and kicks out violently with his hind legs. The capriole can take many years of training. Courbette - The horse balances on the hind legs and then jumps, keeping the hind legs together and the forelegs off the ground. 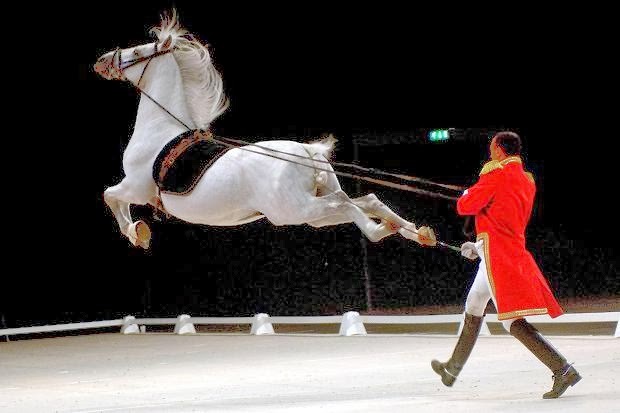 Here is a link to the official Lipizzaner website which shows a video of each of these beautiful movements: http://www.lipizzaner.com/home.asp Click on the “Airs Above the Ground” link. Though Lippizaners are found in many nations throughout Europe and North America, the breed is relatively rare, with only about 3,000 horses registered worldwide. The number of foals born each year is small, and breeders take extreme care to preserve the purity of the breed. 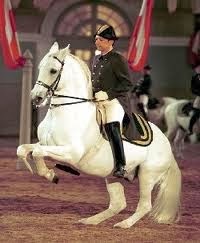 Contrary to popular belief, Lipizzans are not actually true white horses. Most Lipizzans are gray, and like all gray horses, they have black skin, dark eyes, and as adult horses, a white coat of hair. Lipizzans are born dark—usually bay or black—and become lighter each year as the graying process takes place, with the process being complete at between 6 and 10 years of age. Only the most exceptional horses with stamina, beauty, and a good personality are trained to become performers. 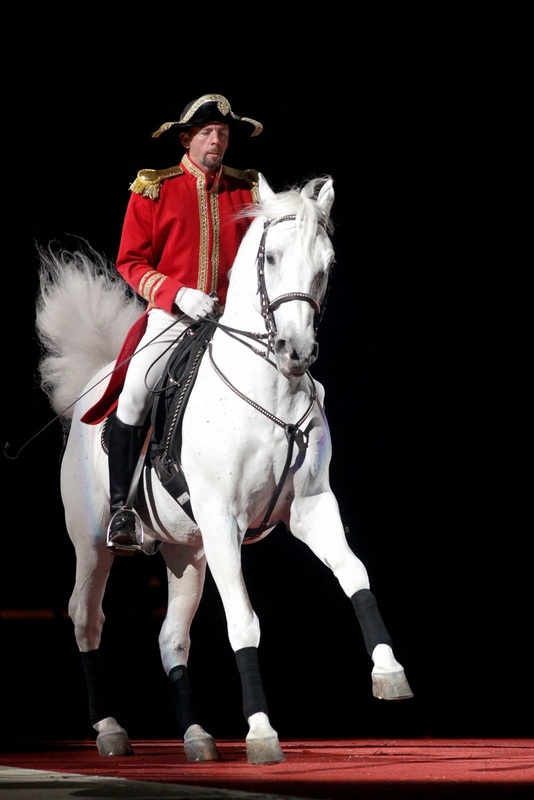 More than 40,000,000 people in North America have had the pleasure of seeing the Lipizzaners perform. I hope that you also get to see them one day. Just released! South Carolina Brides. Visit historic South Carolina where secrets disrupt the lives of three women. A cousin’s quest takes a drastic turn when she falls for the man she thought she despised. A young woman’s sheltered world crumbles after she finds a badly beaten stranger on a nearby plantation. And a sister’s heart is torn when the neighbor who killed her brother in a duel returns home a changed man. Between betrayal and lies, is there room for love? Beautiful post, Vickie. I saw these gorgeous horses train when I was fortunate enough to go to Austria. I really appreciate watching the riders because what they do is very hard. I grew up with horses and performed basic dressage at pony club rallies,etc. If the rider and horse can move as one it's wonderful to watch. As a novice I was concerned about memorizing the course and then trying to focus on where my horse and I were walking, trotting, cantering, etc. within a very tight arena that is posted with letters to cue the rider. Then put a judge and an audience out there and its a bit nerve-racking. I'm in awe of the experts and the Lippizans. Love the pics of the mares and foals. That's so cool you saw the Lippizans in their home country. They are such beautiful creatures. I had several horses, but I never learned dressage. Beautiful horses. I've never had the privilege of seeing these horses preform. We have pure Egyptian Arabians. It's interesting that these elegant horses have the Arab line in them. I find the Arabians very elegant, too. I love Arabians. They are such pretty horses. 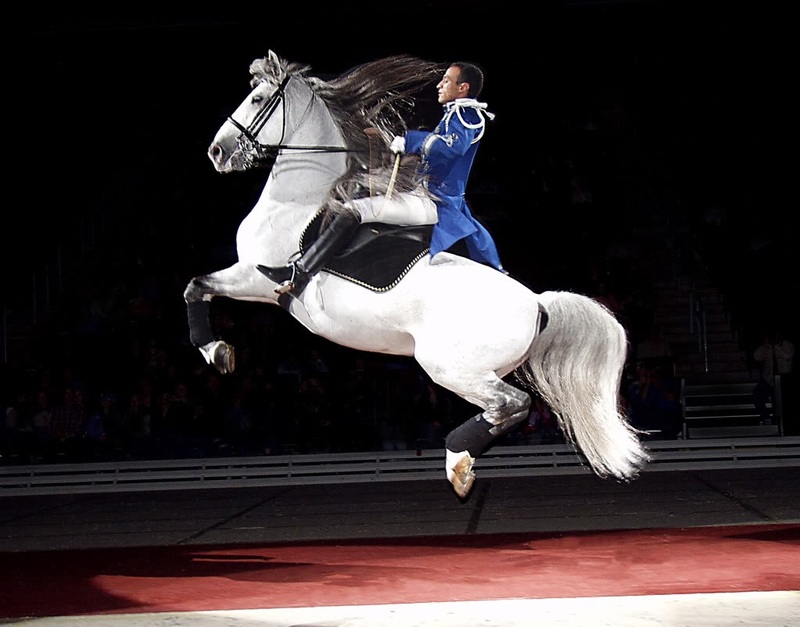 I saw the Lipizzaners perform years and years ago ~ they are poetry in motion! I would love to see them again. 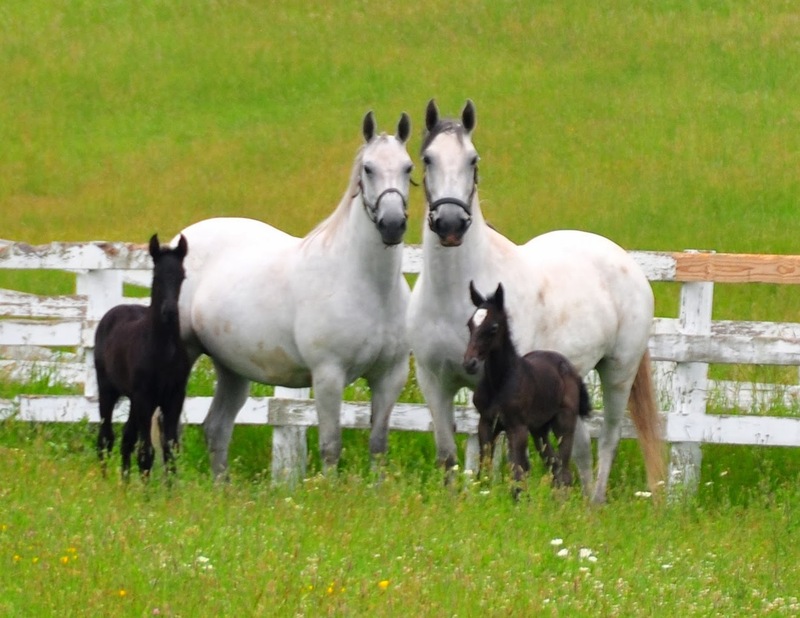 Interesting they are born dark - the picture of the mares with their foals in beautiful! I, too, loved horses growing up and had a few ~ but somehow didn't marry a cowboy! Love him anyway :o) Congrats on the release of South Carolina Brides! Thanks, Rebecca. You're right about the Lippizans being poetry in motion. So beautiful! These horses have fascinated ever since I read a book about them during my teen years. I love horses and living in Texas, it seemed natural that I would have one. Not so. 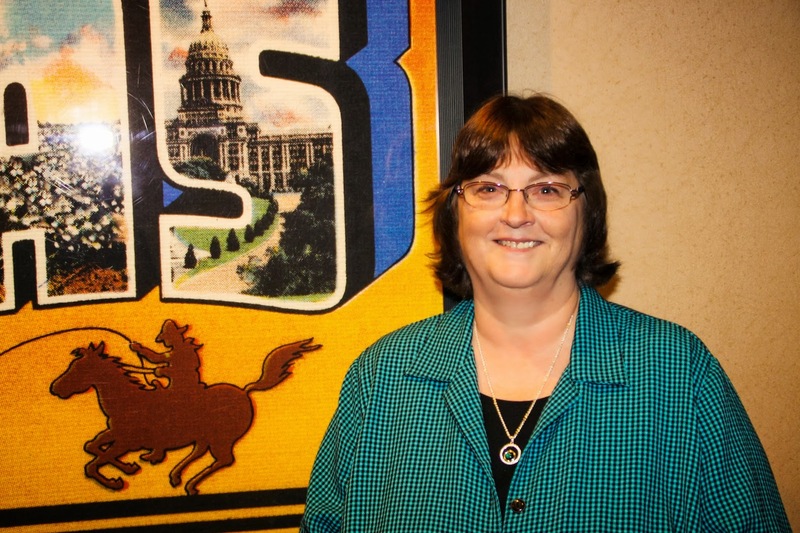 I grew up in Dallas in the middle of the city with only a love for horses. These are beautiful pictures, especially the mares and foals. I've been to Austria and so wanted to see these horses perform, but our schedule did not permit it. Makes me long to return and see them. Thanks for a wonderfully interesting post. I saw them in a few years back when they came to town, Martha. Maybe they'll come to your area one day. If so, I hope you get to go. You'll love seeing their wonderful performance. I agree, Sharon. It's pretty amazing that the foals are so dark when they're born. It takes about six years for them to turn gray--and most of them are considered gray, rather than white. I have never had the pleasure of seeing these beautiful horses perform and I sure do want to now! I bet it would be such a beautiful sight! Your South Carolina Brides sounds like, yet another, great book of yours! Thanks for this wonderful post! Vickie, thank you for this wonderful post. I got to see these horses perform when I was in high school and have never forgotten how wonderful they were.